The Suffolk weather defied the predictions of the meteorologists, and the LX Club team arrived at Harleston to enjoy a brisk sunny atmosphere with several other highly contested cup games also taking place. Inspired by the Harleston Over 18’s and Over 40’s Vets winning performances, the LX team started this game determined to reverse the results of recent years. A storming start by the team pinned the Magpies back in their half. Nigel Spencer-Knott had a magnificent game at centre half, instigating attacks, and intercepting all attacking passes from Magpies in midfield. Brian Heelis at right half marked well, and Sudesh Nayar at left half tackled well, and with well-struck precision passes set up many attacks. The middle forward trio of Graham George, Martin Kavanagh and Adrian Stephenson were more than a handful for the Magpies defence, and Adrian crashed home a tremendous shot to put LX Club 1-0 ahead. After which there were enough good chances to have ensured an emphatic win by half-time for the LX Club. In the second half the skilful Magpies player Peter Finnie, and Magpies first team coach Les Howlett started to enjoy excellent runs into the LX defence, but Gurney White at right back was totally uncompromising and always well defensively positioned to defy the opposition forwards. Nigel Dixon had one of his very best games for LX, with positive kicking and diving saves, making an excellent contribution towards the final winning result. LX Club’s second goal was superb. Tony Williams, playing on the right wing for LX, crossed with a pinpoint pass to Brian Woolcott in the left winger’s correct position by the goalpost. Inspired by Libby White’s instructions “to get on with it”, Brian followed the order to the letter, and coolly slotted home the clinching victory goal, to give LX Club a deserved 2-0 win against the strong Magpies opposition. The after match hospitality was to the usual excellent Harleston Hockey Club standards. The LX Club thanks Vaughn Dearling and Graham Ramm for umpiring the game. The latter voted Sudesh Nayar (LX) and Kim Steggles (Magpies goalkeeper) as ‘Men of the Match’. Also acknowledgement is given to the LX Club players’ wives who supported this game. Finally very special thanks go to Tony Williams, the Match Manager, who organised everything, including two very well balanced teams, choosing to play this time on the winning side! 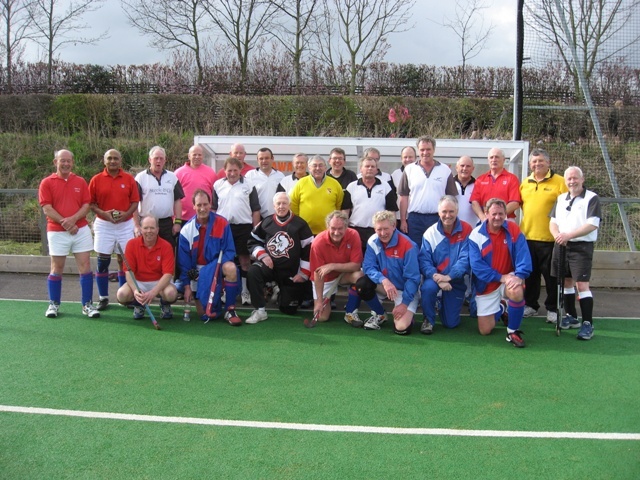 Results overall now – Harleston 5 wins, LX Club 4 wins, 2 draws. LX Club Team Squad: Nigel Dixon, Gurney White, David Read (Capt), Brian Heelis, Nigel Spencer-Knott, Sudesh Nayar, Tony Williams, Graham George, Graham Martin, Martin Kavanagh, Adrian Stephenson, Brian Woolcott.